Raffles Grand Hotel d’Angkor opened in 1932 to accommodate tourists traveling to the Angkor Wat temple, which is now part of a famous UNESCO World Heritage Site. Named for the capital city of the historic Khmer Empire, the Grand Hotel d’Angkor displays timeless architectural designs of ancient Khmer culture throughout its entire structure. When the hotel debuted in the 1930s, many considered it advanced for its time. The first iteration of the Grand Hotel d’Angkor featured 40 rooms, complete with indoor plumbing and private bathrooms. Today, Raffles Grand Hotel d’Angkor has three floors with 119 rooms and suites. The accommodations feature amenities like LCD flat screen televisions, hand-made silk bathrobes, and signature toiletries. The hotel has six dining options, as well as round-the-clock room service. Café d’Angkor features live native music and regular dance shows on almost every night. Guests can choose to take exemplary cooking classes on traditional, Khmer cuisine. There is also a Raffles Spa and Wellness Center, with authentic Southeast-Asian and Khmer treatments. The 15-acre grounds support 15 different meeting spaces that can be used for a countless variety of functions. There is also a business center, dance floor, and complimentary WiFi throughout the hotel. Guests can even charter an elephant tour ride! Tourists today still travel in the thousands to see the sights of the region, especially the Angkor Wat temple and the greater Angkor Archeological Park in which it resides. Guests also may choose to visit any of the nearby floating villages, namely Kampong Phluk, for a boat trip down the local waterways. The Angkor National Museum is also within 10 minutes of the hotel, as is the Tonle Sap Lake. And helicopter tours are available for those interested to see Angkor from the air. 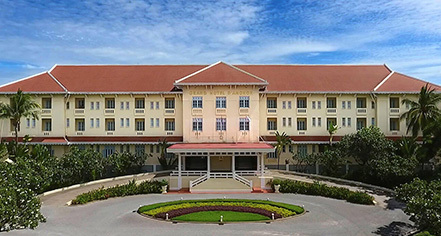 Raffles Grand Hotel d'Angkor, a member of Historic Hotels Worldwide since 2018, dates back to 1932. The original timber and wrought iron elevator has been restored and is still in use today. ATM: Located in hotel lobby. Cancellation Policy: Cancellations must be made before 4:00 p.m. on the day of arrival. Deposit: Must be guaranteed with a credit card at the time of booking. Early Check-In/Late Check-Out: Dependent on room availability and subject to extra fees. Hotel/Resort Fees & Taxes: All reservations are subject to 7% service charge, 2% accommodation tax, and 10% VAT. Rollaways: Available upon request. Fees may apply. Raffles Grand Hotel d’Angkor opened in 1932 to accommodate tourists traveling to the Angkor Wat temple, which is now part of a famous UNESCO World Heritage Site. 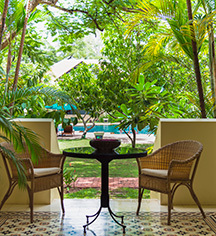 Named for the capital city of the historic Khmer Empire, the Grand Hotel d’Angkor displays timeless architectural designs of ancient Khmer culture throughout its entire structure. Learn more about the History of Raffles Grand Hotel D'Angkor .